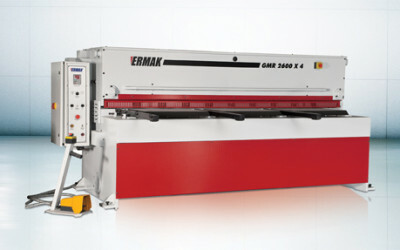 ERMAKSAN quality and experience one the the production of sheet metal working machinery has proven it to type Guillotine Shears (GMR). The static and dynamic stiffness of the body and strong welded construction designed to withstand harsh operating conditions. Especially for thin sheet metarials work very efficiently at high speeds and the best scissor in its class. Less energy consumption, quiet operation, has been presented to the users with a small footprint and affordable price. Buying the ERMAKSAN GMR Shears according to the price and size of a machine which will do many jobs. 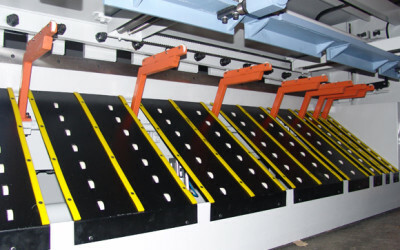 Will have the most competitive prices while preferred GMR model mechanical guillotine shear, with quiet operation and the most appropriate energy efficiency. Does not require large area. Cutting program can be done. High cutting quality can be achieved at high speeds,with space-saving body. High power transmission and torsional strength, balance shaft group. Quiet running, easy maintenance, fast and serial motor + gearbox group. front safety plate for CE standard. Multi-functional, parametric adjustable, programmable controller ELGO P9521. High wear resistance and toughness of the blades. Convenient foot pedal for single and repetitive cutting. Side and front support arms miter. Protective front, side and rear protection covers. Rear sheet metal sliding group.